Gemini spacecraft being prepared in the shop. First American flight to seize duration record from Soviet Union. Mission plan curtailed due to fuel cell problems; mission incredibly boring, spacecraft just drifting to conserve fuel most of the time. Splashed down 145 km from aim point. Launched: 1965-08-21. Returned: 1965-08-29. Number crew: 2 . Duration: 7.96 days. Location: Space Center Houston (NASA Johnson Space Center's Visitor Center), Houston, TX. Major objectives of the eight-day mission were evaluating the performance of the rendezvous guidance and navigation system, using a rendezvous evaluation pod (REP), and evaluating the effects of prolonged exposure to the space environment on the flight crew. Secondary objectives included demonstrating controlled reentry guidance, evaluating fuel cell performance, demonstrating all phases of guidance and control system operation needed for a rendezvous mission, evaluating the capability of either pilot to maneuver the spacecraft in orbit to rendezvous, evaluating the performance of rendezvous radar, and executing 17 experiments. The mission proceeded without incident through the first two orbits and the ejection of the REP. About 36 minutes after beginning evaluation of the rendezvous guidance and navigation system, the crew noted that the pressure in the oxygen supply tank of the fuel cell system was falling. Pressure dropped from 850 pounds per square inch absolute (psia) at 26 minutes into the flight until it stabilized at 70 psia at 4 hours 22 minutes, and gradually increased through the remainder of the mission. The spacecraft was powered down and the REP exercise was abandoned. By the seventh revolution, experts on the ground had analyzed the problem and a powering-up procedure was started. During the remainder of the mission the flight plan was continuously scheduled in real time. Four rendezvous radar tests were conducted during the mission, the first in revolution 14 on the second day; the spacecraft rendezvous radar successfully tracked a transponder on the ground at Cape Kennedy. During the third day, a simulated Agena rendezvous was conducted at full electrical load. The simulation comprised four maneuvers - apogee adjust, phase adjust, plane change, and co-elliptical maneuver - using the orbit attitude and maneuver system (OAMS). Main activities through the fourth day of the mission concerned operations and experiments. During the fifth day, OAMS operation became sluggish and thruster No. 7 inoperative. Thruster No. 8 went out the next day, and the rest of the system was gradually becoming more erratic. Limited experimental and operational activities continued through the remainder of the mission. Retrofire was initiated in the 121st revolution during the eighth day of the mission, one revolution early because of threatening weather in the planned recovery area. Reentry and landing were satisfactory, but the landing point was 145 km short, the result of incorrect navigation coordinates transmitted to the spacecraft computer from the ground network. 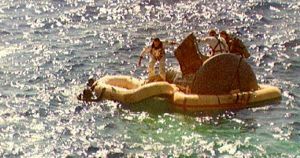 Landing occurred August 29, 190 hours 55 minutes after the mission had begun. The astronauts arrived on board the prime recovery ship, the aircraft carrier Lake Champlain, at 9:25. The spacecraft was recovered at 11:51 a.m.
With this flight, the US finally took the manned spaceflight endurance record from Russia, while demonstrating that the crew could survive in zero gravity for the length of time required for a lunar mission. However the mission was incredibly boring, the spacecraft just drifting to conserve fuel most of the time, and was 'just about the hardest thing I've ever done' according to a hyperactive Pete Conrad. An accident with freeze dried shrimp resulted in the cabin being filled with little pink subsatellites. Official NASA Account of the Mission from On the Shoulders of Titans: A History of Project Gemini, by Barton C. Hacker and Charles C. Alexander, Published as NASA Special Publication-4203 in the NASA History Series, 1977. Although NASA Headquarters refused to allow nicknames for Gemini spacecraft, Cooper was not so easily put off. Conrad's father-in-law had whittled a model covered wagon, which inspired Cooper with the idea of a patch using that motif and the motto: "Eight days or bust." A personal appeal to NASA Administrator Webb led, after much discussion, to approval of the "Cooper patch." But Webb heartily disliked the motto - if the mission did not go the full eight days, for whatever reason, many would say it had "busted" - and turned it down. On Saturday, 21 August, Guenter F. Wendt, the McDonnell pad leader, hustled Cooper and Conrad into their couches. Precisely at 9:00 a.m., they felt the modified Titan II start them on a far longer journey than any made by a bygone, continent-crossing covered wagon. The start was smooth enough but then came the bumps of Pogo. A few seconds before staging, the bouncing stopped. Gemini V cut loose from the booster's second stage at 163 kilometers altitude, with an orbital apogee of 349 kilometers. Because of the mission's length, the supply of oxygen and hydrogen for the fuel cell was a concern. Cooper intended to operate the cells at the lowest possible pressure. But Conrad suddenly noticed that the pressure had upped too low. Flight Control told him to switch on the oxygen heater to raise the pressure. To his surprise, the needle continued to drop. At 2 hours 13 minutes, Cooper yawed the spacecraft 90 degrees and ejected the rendezvous pod. Cooper turned the spacecraft to the rear, flipped on the radar, and got an immediate signal. The radar scale showed the pod moving off at a relative speed of two meters per second. Conrad had expected it to drift away and trail behind the spacecraft, but to his astonishment it went out to the side. Finally it started to follow them as they thought it should. Flight Director Kraft now had his first major problem at the new Mission Control Center. He knew the spacecraft had enough battery power for reentry even if the fuel cell failed completely, but he needed to know if there would be time enough to reach a good reentry zone, such as the mid-Pacific near Hawaii on the sixth revolution. While Kraft waited for an answer, the fuel cell pressure dropped to 83 newtons (120 pounds). McDonnell set up a test in St. Louis to find out the lowest working pressure for a fuel cell. During the fourth revolution, the oxygen pressure stabilized at 49 newtons (71 pounds). About this time, Kraft was assured that the batteries were good for 13 hours. Mission Control Center learned that the low-pressure tests in St. Louis were going well. With these facts in hand, Kraft decided Cooper and Conrad could fly for at least one day. Kranz and his crew then came on duty. While he and his problem solvers wrestled with the heater, Edwin E. Aldrin worked with a Mission Planning and Analysis Division team to design maneuvers for some sore of practice rendezvous now that the pod was out of the picture - just in case the electrical supply should be salvaged. Kranz's team thought it would be safe to go ahead and operate the cells. When Hodge arrived, the three Flight Directors agreed to tell Cooper to turn the electricity back on. They were relieved when the pressure remained stable as the stacks were brought back on the line. Hodge's flight planners gave the crew some experiments and systems checks to perform, which required more and more power. Thinking they might have to land early, the crew had begun to put things away. Now that they were back in business, the cabin was soon full of loose gear again. Then it was time for some rest. It had been a long, cliff-hanging first day for Cooper and Conrad in their "Covered Wagon." While Gemini V drifted, the cabin got cold. The crew turned the airflow on low but continued to shiver. This was different from Mercury flights, where the capsule had tended to overheat. The suit coolant circuit seemed cold, too, so they took the hoses off and stopped the flow inside the suits. As the spacecraft tumbled through space, the sight of the stars spinning around outside the window bothered them until Cooper covered the windows and blocked out the view. Cooper and Conrad had no better luck sleeping than McDivitt and White. At first they tried sleeping alternately, but the dozer was soon disturbed by the ground calling, "Gemini 5, Gemini 5, Gemini 5." As long as one of them was awake, there would be radio transmissions, and they decided this sleep schedule would not work. So they tried, not altogether successfully, to sleep, eat, and work together. Cooper and Conrad considered the third day the high point of the flight. They worked steadily on experiments and did a series of maneuvers for a "phantom rendezvous." Setting up their calculations on the assumption that they were tracking an Agena in a different orbit than the spacecraft, the flight controllers would pass information to the crew, just as though the target vehicle really existed. Using both ground and spacecraft comPutations, Cooper would then maneuver Gemini V to a rendezvous with this moving point in space, giving him a chance to check out the complete maneuvering system. Such precise moves were new to manned space flight, but Cooper came through like a champion, bringing his spacecraft to the exact position Kraft had asked for. Doubts about being able to accomplish rendezvous faded, and the mission planners were confident and ready for Gemini VI. The crew powered the electrical systems down again and resigned themselves to drifting in space, performing experiments when possible. Since the inertial guidance platform was not working, they had little success, although they did some experiments, performed radar tests, and made vision tests. They saw smoke at Laredo, Texas, for example, but did not see a checkerboard pattern that had been laid out for them on a field. In the evening, Cooper asked for some uninterrupted sleep and got it. Cooper slept seven hours and Conrad five, so their work day began at a more normal time. It was to be the last busy shift. First, they saw a rocket sled test as they flew over Holloman Air Force Base, New Mexico. Over Vandenberg, on the next pass, they sighted the contrail of a chase plane just before they glimpsed the ignition of a Minuteman missile. In the Atlantic, they observed their prime recovery carrier, Lake Champlain, with a destroyer astern. But, down below in Mission Control Center, a new problem was causing fresh worries. Since there was no way to dump the fuel cell's product water overboard, its storage tank had been partitioned by a bladder wall; one side held drinking water, the other stored the acidic liquid. As the crew drank, more room for the fuel - cell discharge was provided. But the cells were producing 20 percent more fluid than had been foreseen. When an analysis by Kranz' team disclosed that, even at the high rate of production, there would be some room left at the end of the mission, everyone sighed in relief. Then still another problem arose to plague the mission controllers. Late in the fifth day, the orbital attitude and maneuvering system (OAMS) grew sluggish, and one thruster quit. Kraft canceled all experiments that required fuel, and the crew turned off the electrical system to help reduce the water buildup. Although several possible solutions to the thruster problem were worked out, none was successful. So Cooper and Conrad again drifted through their rest and sleep period, awakening only to find that the whole OAMS had become erratic. Two thrusters had now stopped. The spacecraft drifted for the rest of the mission, with Cooper only turning on the system occasionally to stop excessive tumbling. When things had been working right, the crew had been busy. Now Conrad mentally kicked himself for not bringing a book. Despite all the problems, the crew did a creditable job on the experiments. Only one of the 17 had to be scrubbed - D-2, Nearby Object Photography - since it depended on rendezvous with the pod. Two complementary Department of Defense experiments were successful. Experiment D-1, Basic Object Photography, proved that the crew could acquire, track, and photograph celestial bodies. Weather conditions somewhat hampered D-6, Surface Photography, but Cooper and Conrad did obtain photographs of Merritt Island, Florida; Tampico, Mexico; Rocas Island, Brazil; and Love Field, Dallas, Texas. Defense experiments D-4/D-7, Celestial Radiometry and Space Object Photography, were combined to make irradiance measurements on celestial and terrestrial backgrounds and on rocket plumes. The final defense experiment - S-8/D-13, Visual Acuity/Astronaut Visibility - combined use of an inflight vision tester and the observation of rectangular marks in fields near Laredo, Texas, and Carnarvon, Australia. Weather and operational problems made ground observations difficult - they never were able to see the Carnarvon field, but the Laredo pattern was partially read in the 48th revolution. The tester showed that the crew's vision did not change during the eight-day flight. Gemini V carried the same medical experiments as Gemini IV, plus M-1, Cardiovascular Conditioning, and M-9, Human Otolith Function, to see if the ability to perceive the horizontal deteriorated during flight. Postflight responses were not significantly different from those reported before the mission. Conrad wore inflatable leg cuffs for M-1. When activated, the cuffs pressurized automatically for two minutes out of six. They could be run continuously throughout the flight or be turned off. Conrad had some problems with the equipment but he felt the cuffs might be useful for extremely long missions. His pulse rate returned to normal faster than Cooper's after the flight, and he lost four percent less plasma volume. But this could not be conclusively traced to the use of the cuffs, since individual responses differ. Principal investigator Pauline Beery Mack found that both had lost more calcium than the Gemini IV crew, but she was unwilling to predict a trend since "a form of physiological adaptation may occur in longer space flight." Cooper obtained the first photographs of the light of the moonless sky (zodiacal light and the gegenschein), experiment S-1. He made a series of stepped exposures and took two pictures of the gegenschein, a faint nebulous light opposite the Sun. Like their predecessors, Cooper and Conrad took synoptic terrain and weather photographs. Pictures of the Zagros Mountains showed more detail than the official Geologic Map of Iran. The crew also provided pictorial cloud studies, including tropical storm Doreen. 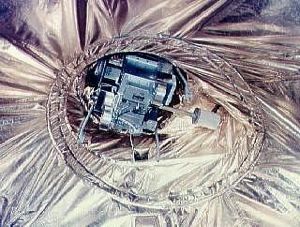 S-7, Cloud-Top Spectrometer, the other science experiment, proved the feasibility of making cloud altitude measurements from spacecraft. During the mission, Hurricane Betsy moved relentlessly toward the planned landing area. The landing area sea-state constraints for Gemini were considerably relaxed from those of Mercury. For Mercury, the limits were winds no more than 34 kilometers per hour (18 knots), waves no more than one and a half meters (five feet); for Gemini, winds up to 47 kilometers (25 knots) and waves up to two and a half meters (eight feet) were acceptable. Weather for Mercury in all of the recovery areas - primary secondary, or contingency - had to be good. No such restraints were ever placed against Gemini - but it certainly could not be expected to touch down in a hurricane area. 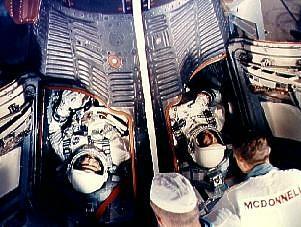 The Weather Bureau recommended that Gemini V be brought down early to avoid landing too near the storm. Kranz agreed in plenty of time for the Lake Champlain to reach the new recovery zone. Because of the erratic, and sometimes inoperable, OAMS, Kraft allowed the crew to use one of the two rings of the reentry control system to position the spacecraft properly more than one revolution before coming back to Earth. During the 120th pass, Cooper told McDivitt (CapCom in Houston for reentry) that Gemini V was ready for retrofire. In the darkness near Hawaii, on the morning of 29 August, at 190 hours 27 minutes 43 seconds, the first retrorocket went off followed by the second and third. After what seemed like an eternity, the fourth fired. Cooper peeked out the window and felt as if he were sitting "in the middle of a fire." With the control system thrusters spewing flame in front and the retrorockets firing behind, a nighttime reentry had to rely strictly on instruments, Cooper discovered. There was absolutely no way of seeing the horizon or a landmark. He and Conrad stayed on instruments until they had passed over the Mississippi in the morning light. Cooper held the spacecraft at full lift until it reached the 120,000-meter altitude and then tilled it to a planned bank angle of 53 degrees. The reentry gauge con indicated that they were high there might be an overshoot the landing point. Cooper, responding to the Instrument, slewed to 90 degrees left instead of 53 to create more drag and reduce the landing error. The g-loads quickly shot from 2 1/2 to 7 1/2. At 20,000 meters, Cooper punched the drogue parachute button. Gemini V, unlike Gemini 1 did not oscillate - it was completely stable on the drogue. Cooper then cut in the second control ring thrusters to discard the fuel as the spacecraft came straight down. He and Conrad watched the main parachute as it unfurled and felt the expected jolt at two-point suspension. In contrast to the McDivitt-White landing, impact was very, very soft. Gemini V landed 190 hours 55 minutes 14 seconds after launch, 130 kilometers short of the planned landing point. The computer had worked as it should in this case - the error had been human. Earth's rotation rate is 360.98 degrees per day. But, in programming the computer, someone had left off the two decimal-place numbers and fed the machine just the 390 degrees. Cooper's efforts to compensate for what he recognized as an erroneous reading had brought them down closer to the ship than they would otherwise have been. The short landing caused no problems for the U.S. Navy recovery forces. 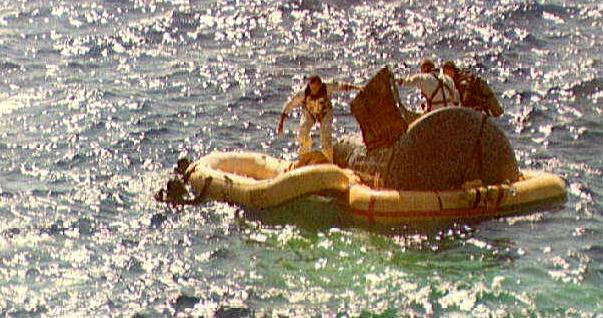 A helicopter soon arrived over the spacecraft and three swimmers dropped into the water. Cooper and Conrad were very comfortable. With a calm sea, Cooper wanted to stay with the spacecraft on this pleasant summer morning (about 8:30, Cape time) until he learned that the carrier was still 120 kilometers away. Then he and Conrad rode the helicopter to the Lake Champlain. The admiral welcomed them aboard ship. Asked what they had been thinking about when it looked as though the fuel cell heater problem might cause the mission to end early, Conrad pointed out a picture he had drawn between the spacecraft seats of a covered wagon halfway over a cliff. Although the crew's worries were over, Berry's were not. His postflight concern was the trend in plasma volume and calcium losses, which were increasing on these longer missions. He was aware that the crew had been forced to drift through space the last three days, with little to do; but they should have exercised more. Two days later, to Berry's relief, both were physiologically almost back to normal. The primary objective of the Gemini V mission to demonstrate man's ability to function in the space environment for 8 days and to qualify the spacecraft systems under these conditions was met. This milestone duplicated the period required for the manned lunar exploration mission. Gemini V also demonstrated the capability of man to withstand prolonged periods of weightlessness. The adaptability of the human body was indicated by the performance of the astronauts. For example, their heartbeat rates gradually dropped to a level significantly lower than their preflight normal rates, but by the fourth day, adapted to the weightless condition and leveled off. Upon return to Earth, the heartbeat rates were slightly higher than normal, as expected, but returned to normal rate during the second day. This has assured us of man's capability to travel to the Moon and return. Postflight activities for Cooper and Conrad included a six-nation goodwill tour assigned to them by President Johnson. During the trip, they attended the International Astronautical Federation Congress in Athens, where they talked with the crew of Voskhod II, Russian Cosmonauts Aleksey Leonov and Pavel Belyayev. NASA now turned to plans for the rendezvous and docking mission and for the final long-duration flight, both scheduled before the end of the year. The goal of five manned flights in a single year seemed phenomenal, compared with the experience of Project Mercury. But Gemini IV and Gemini V had indeed proved to be pillars of confidence, a solid base from which to build. Family: Manned spaceflight. People: Conrad, Cooper. Country: USA. Spacecraft: Gemini. Launch Sites: Cape Canaveral. Agency: NASA Houston. 1964 January 1 - . NASA Headquarters directed Gemini Project Office to take the radar and rendezvous evaluation pod out of Gemini-Titan (GT) missions 3 and 4. - . Nation: USA. Flight: Gemini 4, Gemini 5. Spacecraft: Gemini, Gemini Radar, Gemini REP.
NASA Headquarters directed Gemini Project Office to take the radar and rendezvous evaluation pod out of Gemini-Titan (GT) missions 3 and 4. GT-4 would be a battery-powered long-duration flight. The pod would go on GT-5, and thus the first planned Agena flight would probably slip in the schedule. 1964 January - . LV Family: Titan. Launch Vehicle: Titan II. The program plan for Gemini extravehicular operations was published. - . Nation: USA. Flight: Gemini 10, Gemini 11, Gemini 12, Gemini 5, Gemini 6, Gemini 7, Gemini 8, Gemini 9. Spacecraft: Gemini. 1964 May 31 - . Gemini orbit attitude and maneuver system thrust chamber assembly designs frozen. - . Nation: USA. Flight: Gemini 5, Gemini 6. Spacecraft: Gemini, Gemini OAMS/RCS. 1964 June 25 - . LV Family: Titan. Launch Vehicle: Titan II. Gemini launch vehicle (GLV) 5 in assembly - . Nation: USA. Flight: Gemini 5. Spacecraft: Gemini. Martin-Baltimore received the propellant tanks for Gemini launch vehicle (GLV) 5 from Martin-Denver, which had begun fabrication in October 1963. Aerojet-General delivered the flight engines for GLV-5 November 5. Tank splicing was completed December 5; engine installation December 9. Final horizontal tests were completed January 7, 1965. 1964 July 10 - . LV Family: Titan. Launch Vehicle: Titan II. 1964 July 10-25 - . LV Family: Titan. Launch Vehicle: Titan II. Tests conducted on fuel cells planned for Gemini-Titan 5 mission. - . Nation: USA. Flight: Gemini 5. Spacecraft: Gemini, Gemini Fuel Cell. Gemini Program Office reported that tests had been conducted on section I of the fuel cells planned for the long-duration Gemini-Titan 5 mission. These tests had resulted in a failure characterized by output decay. A complete investigation was in process to determine the cause of the failure. 1964 September 29 - . LV Family: Titan. Launch Vehicle: Titan II. Power sources for Gemini-Titan (GT) 5 - . Nation: USA. Flight: Gemini 4, Gemini 5. Spacecraft: Gemini, Gemini Fuel Cell. First production rendezvous radar accepted. - . Nation: USA. Flight: Gemini 5. Spacecraft: Gemini, Gemini Radar. Gemini Program Office reported that the first production rendezvous radar, intended for spacecraft No. 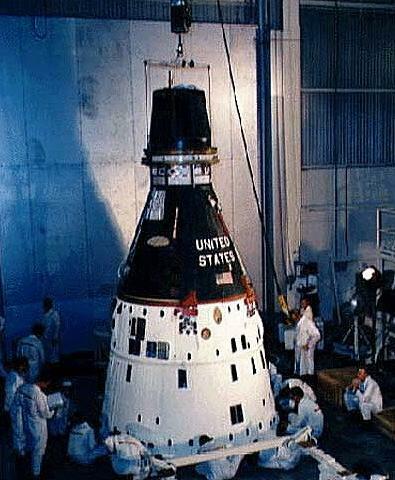 5, had completed its predelivery acceptance test. .
1965 February 5 - . LV Family: Titan. Launch Vehicle: Titan II. Modifications to Gemini launch vehicle 5 completed - . Nation: USA. Flight: Gemini 5. Spacecraft: Gemini. Modifications to Gemini launch vehicle 5 were completed and stage I was erected in the vertical test facility at Martin-Baltimore. Stage II was erected February 8. Power was applied to the vehicle for the first time on February 15, and Subsystems Functional Verification Tests were completed March 8. Another modification period followed. 1965 February 8 - . LV Family: Titan. Launch Vehicle: Titan II. 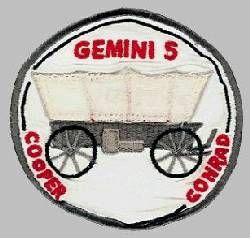 Cooper and Conrad named as crew for the seven-day Gemini-Titan 5 mission. - . Nation: USA. 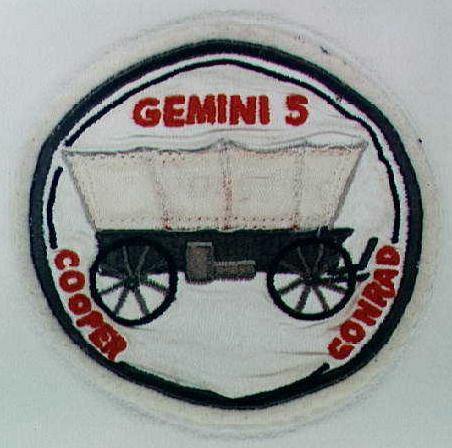 Flight: Gemini 5. Spacecraft: Gemini. 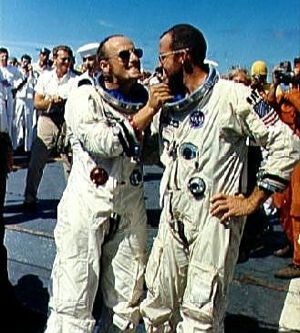 Manned Spacecraft Center announced the selection of L. Gordon Cooper, Jr., as command pilot and Charles Conrad, Jr., as pilot for the seven-day Gemini-Titan 5 mission. Backup crew would be Neil A. Armstrong and Elliot M. See, Jr..
1965 March 14 - . McDonnell finished manufacturing, module tests, and equipment installation for Gemini spacecraft No. 5. - . Nation: USA. Flight: Gemini 5. Spacecraft: Gemini. McDonnell finished manufacturing, module tests, and equipment installation for Gemini spacecraft No. 5. Spacecraft assembly was completed April 1 with the mating of the reentry and adapter assemblies. Systems Assurance Tests began April 30.. The orbit attitude and maneuver system (OAMS) 25-pound thrusters installed in spacecraft No. 4 were replaced with new long-life engines. - . Nation: USA. Flight: Gemini 4, Gemini 5. Spacecraft: Gemini, Gemini OAMS/RCS. McDonnell completed Systems Assurance Tests of Gemini spacecraft No. 5. - . Nation: USA. Flight: Gemini 5. Spacecraft: Gemini, Gemini Fuel Cell. The environmental control system was validated April 24, and fuel cell reinstallation was completed April 26. The fuel cell had failed during reentry/adapter mating operations on April 16..
1965 April 21 - . LV Family: Titan. Launch Vehicle: Titan II. 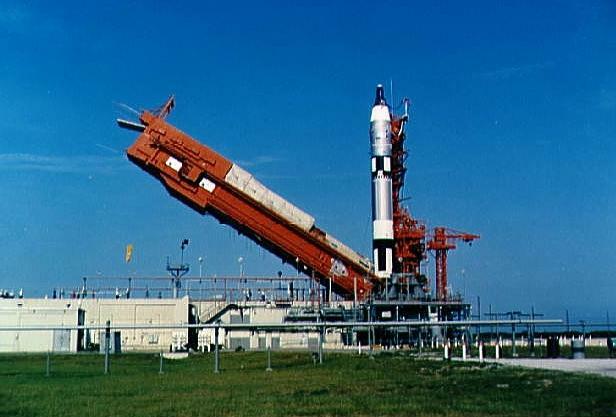 Acceptance Test of Gemini launch vehicle (GLV) 5 - . Nation: USA. Flight: Gemini 5. Spacecraft: Gemini. The Combined Systems Acceptance Test (CSAT) of Gemini launch vehicle (GLV) 5 was conducted in the vertical test facility at Martin-Baltimore. Four earlier CSAT attempts (April 15-20) were marred by numerous minor anomalies. The vehicle acceptance team inspection began April 26 and concluded April 30, with GLV-5 found acceptable. The vehicle was removed from the test cell May 7-8, formally accepted by the Air Force May 15, and shipped to Cape Kennedy. Stage I arrived at the Cape on May 17 and stage II on May 19. 1965 April 22 - . LV Family: Titan. Launch Vehicle: Titan II. Abort criteria for Gemini-Titan (GT) 4 - . Nation: USA. Flight: Gemini 4, Gemini 5. Spacecraft: Gemini. The Abort Panel met to review abort criteria for Gemini-Titan (GT) 4 and decided that GT-3 rules would suffice. Alternate procedures for delayed mode 2 abort would be investigated when the Manned Spacecraft Center abort trainer became available to the GT-5 mission. The Simulated Flight Test of Gemini spacecraft No. 5 began at McDonnell. - . Nation: USA. Flight: Gemini 5. Spacecraft: Gemini. During the test (April 28) the environmental control system (ECS) was inadvertently overpressurized. The test was halted while the ECS suit loop was investigated. Reinstallation was completed May 8, and the ECS and guidance and control systems were retested May 9-11. Simulated flight testing was resumed May 11 and completed May 19. Preparations for altitude chamber testing lasted until May 25. 1965 May 26 - . McDonnell began altitude chamber tests of Gemini spacecraft No. 5. - . Nation: USA. Flight: Gemini 5. Spacecraft: Gemini, Gemini Fuel Cell. Testing was interrupted by a fuel cell failure on June 1, and fuel sections were replaced. Modifications and preparations for retest concluded June 12, and an overall systems test with the fuel cell was conducted..
1965 June 7 - . LV Family: Titan. Launch Vehicle: Titan II. 1965 June 19 - . McDonnell delivered Gemini spacecraft No. 5 to Cape Kennedy. - . Nation: USA. Flight: Gemini 5. Spacecraft: Gemini. Industrial area activities were completed June 25. The spacecraft was moved to complex 19 and hoisted into position atop the launch vehicle June 26. Beginning with this spacecraft, the Premate Systems Tests and Premate Simulated Flight Test were combined to form the Premate Verification Test, which was performed on all subsequent spacecraft. The Premate Verification Test of spacecraft No. 5 was conducted June 30-July 2. 1965 June 25 - . LV Family: Titan. Launch Vehicle: Titan II. Acceptance Test of Gemini launch vehicle (GLV) 6 - . Nation: USA. Flight: Gemini 5. Spacecraft: Gemini. The Combined Systems Acceptance Test of Gemini launch vehicle (GLV) 6 was completed at Martin-Baltimore. The vehicle acceptance team convened July 6 to review GLV-6 and accepted it July 10. The vehicle was demated on July 19 and formally accepted by the Air Force July 31. Stage II was delivered to Cape Kennedy the same day, and stage I on August 2. Both stages were then placed in storage pending the launch of Gemini-Titan 5. 1965 July 7 - . LV Family: Titan. Launch Vehicle: Titan II. Gemini launch vehicle (GLV) 5 and spacecraft No. 5 were mechanically mated at complex 19. - . Nation: USA. Flight: Gemini 5. Spacecraft: Gemini. The Electrical Interface Integrated Validation and Joint Guidance and Control Test began immediately and was completed July 9. The spacecraft/GLV Joint Combined Systems Test followed on July 12. The Flight Configuration Mode Test completed systems testing on July 16. 1965 July 12 - . Extravehicular activity deleted from Gemini missions 5, 6, and 7. - . Nation: USA. Flight: Gemini 5, Gemini 6, Gemini 7. Spacecraft: Gemini. NASA Headquarters Gemini Program Office informed Manned Spacecraft Center that it had decided to delete extravehicular activity from Gemini missions 5, 6, and 7. .
1965 July 23 - . LV Family: Titan. Launch Vehicle: Titan II. Gemini-Titan 5 demated. - . Nation: USA. Flight: Gemini 5. Spacecraft: Gemini. Gemini-Titan (GT) 5 was demated following completion of the Wet Mock Simulated Launch to allow the spacecraft fuel cells to be replaced and the coolant bypass to be modified. Spacecraft and launch vehicle were remated August 5. Modified Electrical Interface Integrated Validation and the Joint Guidance and Control Tests were run on August 6. Spacecraft Final Systems Test on August 9-10 and the Simulated Flight Test on August 13 completed prelaunch testing of GT-5, scheduled for launch August 19. 1965 July 27 - . Gemini Program Manager Charles W. Mathews initiated a spacecraft manager program by assigning one engineer to Gemini spacecraft No. 6. - . Nation: USA. Flight: Gemini 5, Gemini 6. Spacecraft: Gemini. 1965 August 19 - . LV Family: Titan. Launch Vehicle: Titan II. Launch of Gemini-Titan 5 scrubbed. - . Nation: USA. Flight: Gemini 5. Spacecraft: Gemini, Gemini Inertial Guidance System. A spacecraft computer malfunction caused a hold of the countdown 10 minutes before the scheduled launch of Gemini-Titan 5. While the problem was being investigated, thunderstorms approached the Cape Kennedy area. 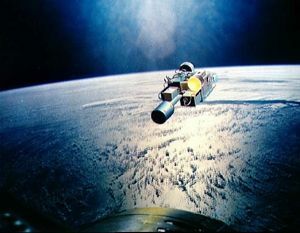 With the computer problem unresolved and the weather deteriorating rapidly, the mission was scrubbed and rescheduled for August 21. Recycling began with unloading propellants. 1965 August 21 - . 14:00 GMT - . Launch Site: Cape Canaveral. Launch Complex: Cape Canaveral LC19. LV Family: Titan. Launch Vehicle: Titan II GLV. Gemini 5 - . Call Sign: Gemini 5. Crew: Conrad, Cooper. Backup Crew: Armstrong, See. Payload: Gemini SC5/Rendezvous Evaluation Pod. Mass: 3,605 kg (7,947 lb). Nation: USA. Agency: NASA Houston. Class: Manned. Type: Manned spacecraft. Flight: Gemini 5. Spacecraft: Gemini. Duration: 7.96 days. Decay Date: 1965-08-29 . USAF Sat Cat: 1516 . COSPAR: 1965-068A. Apogee: 395 km (245 mi). Perigee: 304 km (188 mi). Inclination: 32.60 deg. Period: 91.50 min. Major objectives of the eight-day mission were evaluating the performance of the rendezvous guidance and navigation system, using a rendezvous evaluation pod (REP), and evaluating the effects of prolonged exposure to the space environment on the flight crew. Secondary objectives included demonstrating controlled reentry guidance, evaluating fuel cell performance, demonstrating all phases of guidance and control system operation needed for a rendezvous mission, evaluating the capability of either pilot to maneuver the spacecraft in orbit to rendezvous, evaluating the performance of rendezvous radar, and executing 17 experiments. The mission proceeded without incident through the first two orbits and the ejection of the REP. About 36 minutes after beginning evaluation of the rendezvous guidance and navigation system, the crew noted that the pressure in the oxygen supply tank of the fuel cell system was falling. Pressure dropped from 850 pounds per square inch absolute (psia) at 26 minutes into the flight until it stabilized at 70 psia at 4 hours 22 minutes, and gradually increased through the remainder of the mission. The spacecraft was powered down and the REP exercise was abandoned. By the seventh revolution, experts on the ground had analyzed the problem and a powering-up procedure was started. During the remainder of the mission the flight plan was continuously scheduled in real time. Four rendezvous radar tests were conducted during the mission, the first in revolution 14 on the second day; the spacecraft rendezvous radar successfully tracked a transponder on the ground at Cape Kennedy. During the third day, a simulated Agena rendezvous was conducted at full electrical load. The simulation comprised four maneuvers - apogee adjust, phase adjust, plane change, and coelliptical maneuver - using the orbit attitude and maneuver system (OAMS). Main activities through the fourth day of the mission concerned operations and experiments. During the fifth day, OAMS operation became sluggish and thruster No. 7 inoperative. Thruster No. 8 went out the next day, and the rest of the system was gradually becoming more erratic. Limited experimental and operational activities continued through the remainder of the mission. Retrofire was initiated in the 121st revolution during the eighth day of the mission, one revolution early because of threatening weather in the planned recovery area. Reentry and landing were satisfactory, but the landing point was 145 km short, the result of incorrect navigation coordinates transmitted to the spacecraft computer from the ground network. Landing occurred August 29, 190 hours 55 minutes after the mission had begun. The astronauts arrived on board the prime recovery ship, the aircraft carrier Lake Champlain, at 9:25. 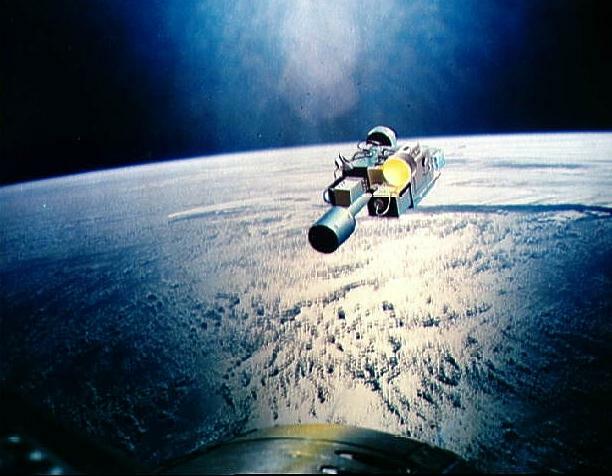 The spacecraft was recovered at 11:51 a.m.
Russian view of Gemini 5 - . Nation: Russia. Flight: Gemini 5. Spacecraft: Gemini. Kamanin notes that Gemini 5's main mission was to set a new space endurance record to surpass the Soviet Union; photographic coverage of Cuba, China, Vietnam, and other countries; and practice rendezvous with an Agena spacecraft. He notes the launch postponements, that the astronauts had to spend 8 hours in the capsule, awaiting launch, and the electrical power problems. 1965 August 26 - . Gemini 5 sets new space endurance record - . Nation: Russia. Related Persons: Malinovskiy, Smirnov. Flight: Gemini 5. Spacecraft: Gemini. Kamanin, earlier believing the problems aboard the flight indicated the unreliability of American equipment, is discouraged. He blames Malinovskiy and Smirnov for lack of support for the space program and the ridiculous situation whereby VVS pilots are being shot into space aboard missiles and spacecraft designed by artillery specialists. They oppose manned space reconnaissance, and here the Gemini crew is photographing the territory of brother socialist states..
1965 August 28 - . Korolev secretly puts Voskhod production on back burner. - . Nation: Russia. Related Persons: Korolev. Program: Voskhod, Soyuz. Flight: Gemini 5, Soyuz 1, Soyuz 2A, Voskhod 3, Voskhod 4, Voskhod 5, Voskhod 6. Spacecraft: Soyuz 7K-OK, Voskhod, Gemini. 1965 August 29 - . Landing of Gemini 5 - . Return Crew: Conrad, Cooper. Nation: USA. Related Persons: Conrad, Cooper. Flight: Gemini 5. Spacecraft: Gemini. The crew had to use the re-entry thrusters to orient the spacecraft due to OAMS system failures. The retrofire and re-entry were conducted in darkness by the spacecraft computer. However the computer had been misprogrammed with an erroneous rotation rate of the earth (390 degrees per day instead of 360.98 degrees per day). 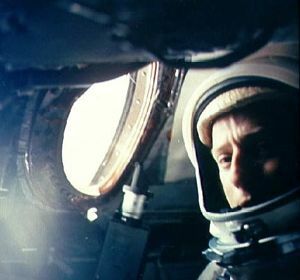 Cooper's efforts compensated for what he recognized as an erroneous reading and brought the capsule down closer to the ship than they would otherwise have been. 1965 September 8 - . American vs Soviet programs - . Nation: Russia. Program: Voskhod, Soyuz. Flight: Gemini 5. Spacecraft: Gemini.